Accountability. Quality. Dignity. Innovation. These are all words that guide Firsthand Foods’ values. If you peruse our meat department, you will see that Firsthand is our sole meat distributor. That is not a fluke! Firsthand Food is a female owned company that represents the same values that drive us here at the co-op; the desire to feed the community delicious and accessible food while making ethical choices about where the food is sourced, how it is produced and how the animals are treated. 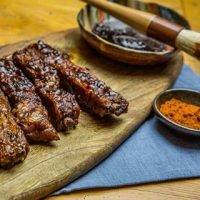 Firsthand Foods traces every piece of meat back to its farm of origin and the farmers who raised it. Their farmers follow strict protocols to take care of the animals, land, water, and air we breathe. They source only the highest quality meats to ensure that every single cut that we sell to you, our loyal customers, are the best quality that money can buy! Their farmers treat their animals with respect and raise them outdoors on pasture and their processors are small-scale, family run businesses that operate on a human-scale, using humane practices. 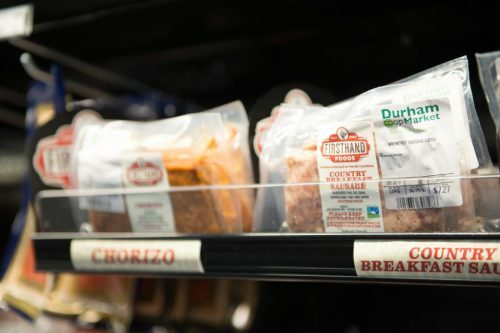 You always know what you’re going to get when you purchase Firsthand from our meat case! Ready for the icing on the cake?! We have a ton of meat cuts on sale just in time for your 4th of July cookouts! Check out all of the other awesome deals we have going on this week: www.durham.coop/app/uploads/2014/12/Fresh-Deals-RED-WHITE-BLUEBERRIES.pdf. Also, let your taste buds travel the Tour de Pork, a showcase of local pork at 20 participating restaurant in June and July presented by Firsthand Foods!